Exercising from home needn’t be expensive, or take up to much space. The Exerpeutic 400XL is compact, folds up for easy storage and comes in at less than $150, you can even have it delivered with free postage! By striping away all the features that add cost to other models Exerpeutic have designed the 400XL to be simple, easy to use and well built. Tucked away in the body of this bike is a well balanced fly wheel, this is tured by the pedals via a quiet belt drive. Exerpeutic have gone for a simple, but effective V-Belt Double Drive system. This requires no maintenance and will give years of trouble free use. As you can see from the image, the rider sits back comfortably on a wide well padded seat. We find this a great way to relax while exercising. With the integrated back rest it’s possible to sit comfortably here for an hour or so while you work out. There are a couple of hand grips, but I often find myself reading a book! Because you are sat low to the ground the bike is exceptionally stable, the low center of gravity means that the bike won’t move from side to side as you ride. 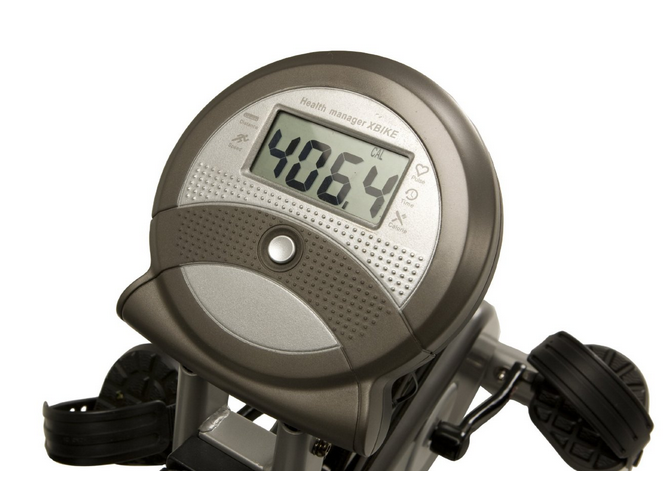 Controlled via a knob at the front of the bike, the 400XL offers 8 levels of resistance. This is delivered via a magnetic system that keeps the pedal motion smooth even as they become harder to turn. Exerpeutic have even managed to pack a simple console in with this bike. This will keep you on target as you get stronger. The console displays stats such as work out time, pulse, calories and distance travelled. So you can set yourself goals and improve every time you get on the bike. The pulse is measured via the handgrips, comfortably located each side of the saddle. By keeping your pulse in the training zone you can improve the effectiveness of the workout. I sometimes find these the hardest part of the bike, building it at home. Fortunately the 400xl is really simple to put together. All the tools needed are included. From start to finish takes 45 minutes, following the detailed instructions. As this is not a big machine it can easily be assembled by a single person. One issue we did find, is that while the bike is easy enough to put together the manual was overly complicated! When you see the bike you will see that it is incredibly simple. If you want to see more recumbent exercise bikes check out our full list here of Recumbent Exercise bike reviews. What are other reviews saying about the Exerpeutic 400XL? This is an extremely popular and well liked bike. At the time of writing this bike has received over 500 customer reviews more than half of which are for a top 5 star rating. Customers like the ease of assembly, the comfortable riding position and that its so quiet they can watch television while working out. Any issues with this bike? With this number of units shipped its surprising that there are not more complaints. There were only a couple someone had an issue with some cracked plastic on the housing, which happened after a year of use. Another was a problem with the console which Exerpeutic replaced under warranty. Apart from the two above this bike seems, for the price, well made and comfortable. I really like this recumbent. It represents incredible value for money. For less than two months gym membership you cannot really go wrong. Its strong enough to take riders up to 300lbs, comfortable and easy to use. 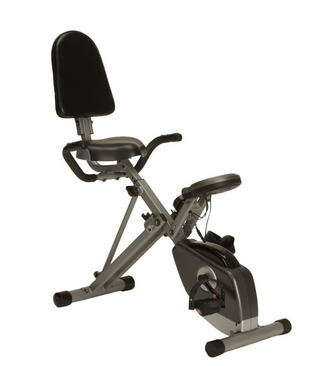 If you are looking for an entry level recumbent then the Exerpeutic 400XL would be a great first choice. We have no worries about its durability or ability to help lose weight and get fit. The fact that it has over 800 positive reviews suggests that it is an all round winner and loved by thousands. Its clear that Exerpeutic have designed the Exerpeutic 400XL recumbent bike with two things in mind: Portability and Value, for us they have absolutely nailed it. Light enough to be carried in one hand, yet strong enough to handle riders of up to 300lbs. All in a package that costs less than $200. For under $150 this is hard to beat!